I've been using Mionix mice for years now, because being a regular person, and not a pro gamer, I value ergonomics over performance. 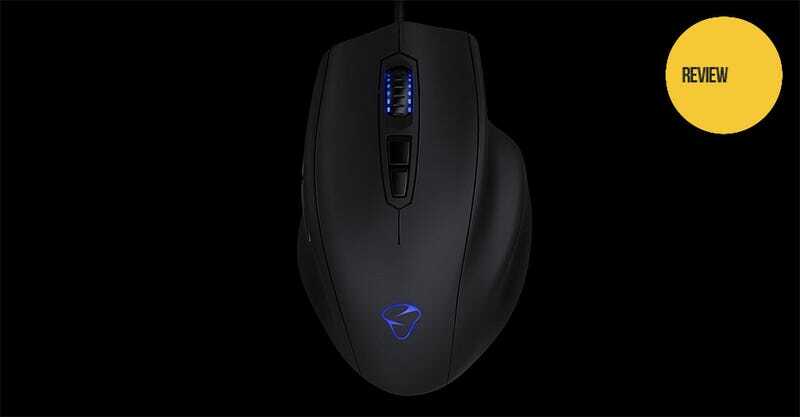 But what happens when Mionix get around to making a mouse that feels as good as it works? You get, at least in theory, the Mionix Naos 7000. Which is an awesome gaming mouse. On the outside, it looks exactly the same as the company's last few flagship mice. Even feels (mostly) the same. Indeed, if it wasn't for the removal of DPI LED lights on the side (which I never used on the 8200 anyway), I couldn't tell the difference between the three. There's the same top-shelf ergonomics, which makes the mouse comfortable to use all day long. There's the same soft-rubber, matte finish which provides fantastic grip and feels expensive. And, best of all, there's the same restraint in terms of design, with only a small Mionix logo at the base and a light under the mousewheel breaking from the solid, stealth-black appearance. A few tweaks have been made in terms of your interaction with the mouse. The mousehweel feels slightly heavier, with a more discernable click to it. It's also slightly heavier than its predecessor, the 8200, and while the specs sheet says it's only by a margin of 4 grams, I noticed it almost immediately (and was thankful for it, since the 8200 always felt a little too light compared to its heavier sibling, the 5000). For the most part, though, it's a case of ain't broke, don't fix. People like myself dig the mice for their comfort, practicality and simplicity. Not every gaming mouse needs to be a neon-flashing monstrosity of angles and flourishes. Where changes have been made is inside the mouse. The 8200, as much as it was fine for me as a regular (if heavy) gamer, was a laser mouse, which those serious about their competitive gaming (first person shooters especially) mightn't have been too happy with. The 7000 is an optical mouse, which apparently offers smoother movement and improved accuracy at higher speeds, with a maximum DPI of 7000 (hence the name). I'll be honest - I put the 8200 and 7000 through their paces in Battlefield 4, Portal 2 and some Total War for comparison and my regular human hand/brain just couldn't tell the difference. If you're the kind of gamer who can (or thinks they can), then I apologise from the bottom of my heart. This review won't be for you, sorry. Please direct all complaints to plunkettATkotakuDOTcom. All I can say is that as a writer and a strategy gamer, I judge a mouse on its feel (for comfort during prolonged gaming) and build quality, and the NAOS 7000 is, like its predecessors were at the time, the best damn gaming mouse I've ever used.